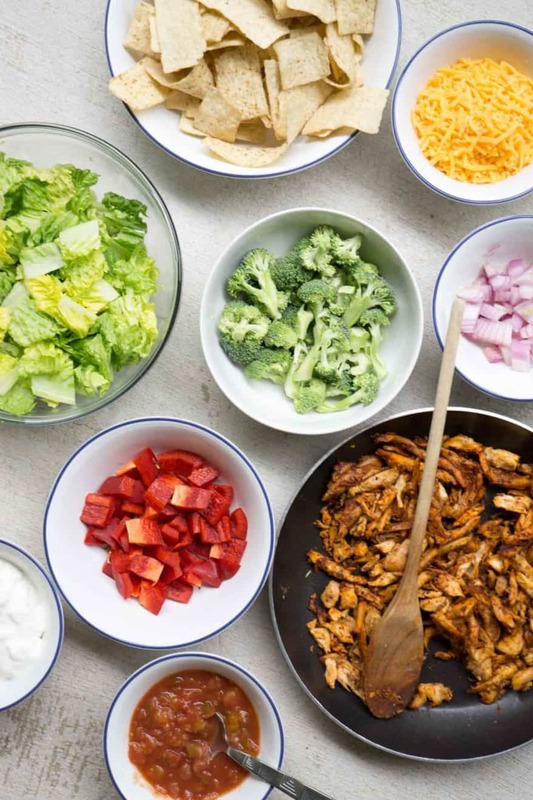 With a store bought rotisserie chicken, you can prepare the meat for a chicken taco salad in 5 minutes! Hands up if you love rotisserie chicken! Picking up a pre-cooked rotisserie chicken at the grocery store is one of my favourite mealtime shortcuts. In a few minutes I remove the meat from the chicken, and then I can use it in recipes throughout the week! This recipe is a simple way to turn rotisserie chicken into taco filling! Just use whatever ingredients you have on hand to throw together a salad. One of the biggest feeding traps parents fall into is catering to each family members’ tastes. This requires parents to prepare separate foods for all of their kids (or even the adults). I totally empathize that a) it’s not fun to have mealtime battles and b) parents may be concerned with their child’s growth. But preparing separate food is not the best plan for a long term solution. I won’t get into the whole plan (because a proper feeding plan encompasses a lot of different points) but one concept I promote with my clients is the #onefamilyonemeal movement. There are great ways to respect your child’s current repertoire of foods WHILE also exposing them to new food WHILE only preparing one meal! That’s what I call a win-win solution. 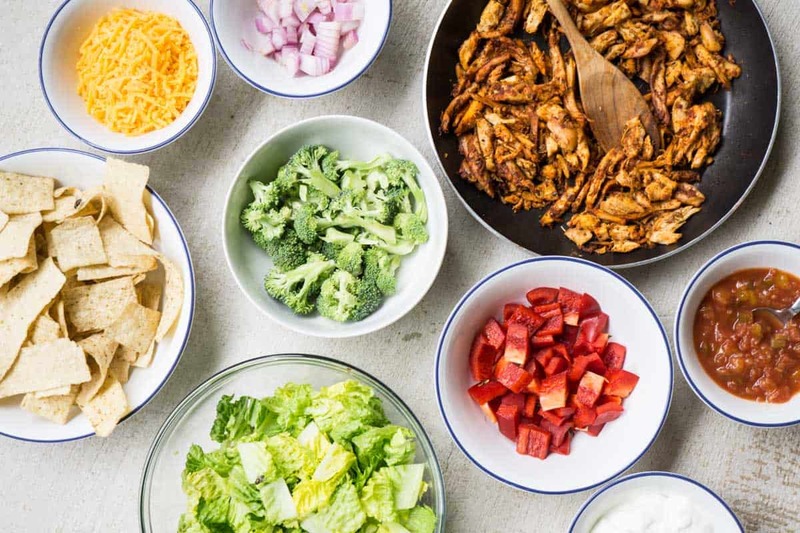 Preparing a taco salad bar is one example of this win-win solution. You can prepare all the different ingredients, place them on the table, and each person can choose what goes in their bowl. Since the taco chicken meat might be spicy to kids, you can keep some chicken unseasoned. The last time I made this, my four year old chose to put peppers, cheese and salsa in his salad and eat some broccoli and unseasoned chicken on the side. I was 100% okay with trusting him to choose which foods to eat! Taco salads are one of my favourite ways to get the taco taste and load up on veggies at the same time! They’re kind of like upside down nachos! With nachos, you start with a base of tortilla chips and cheese, then top with veggies. With taco salad, you start with a base of veggies, then top with chips and cheese! 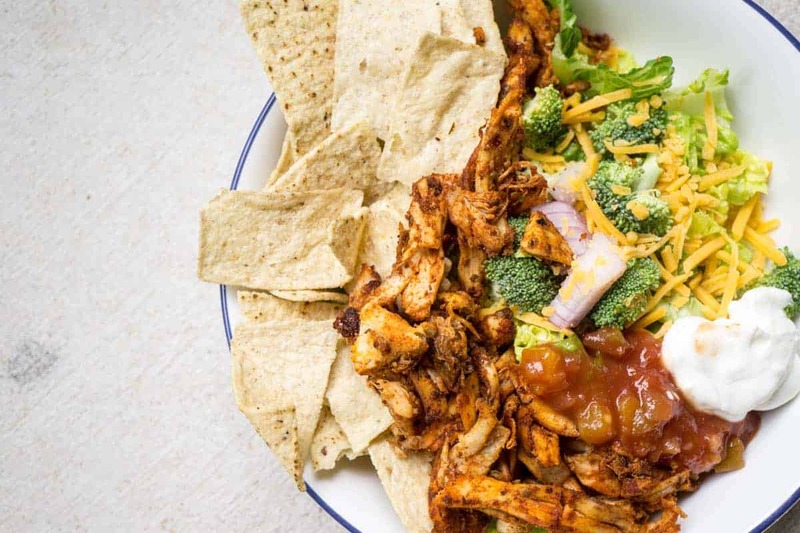 Depending on your appetite, you could easily consume 3-4 servings of veggies in one chicken taco salad plate. 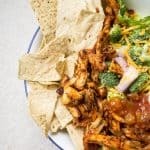 The dressing for chicken taco salad is also really healthy: just Greek yogurt, which is a great source of protein, and salsa, which provides more veggies! Want more Tex Mex dinner ideas? 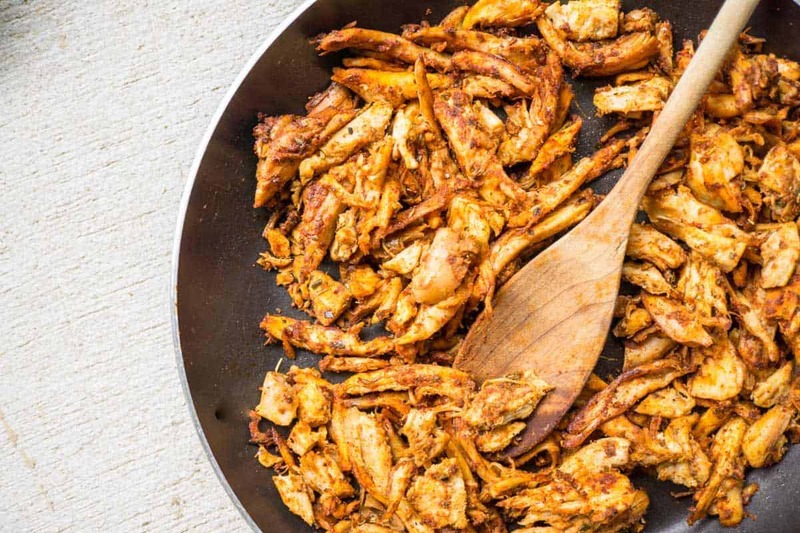 With a store bought rotisserie chicken you can make chicken taco meat in 5 minutes! Pull the chicken apart with your fingers into bite sized pieces. Place the chicken and the spices into a frying pan and heat over medium. Saute until the chicken and spices are combined and the chicken is heated through. You can allow it to get a little crispy if you like it that way. Prep the ingredients and then invite everyone to make their own salad bowls!